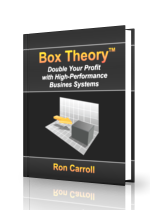 "Box Theory: Double Your Profit with High-Performance Systems and Processes"
Learn how to create effective business systems and processes that will eliminate waste, inefficiency, and frustration, while dramatically improving your customer loyalty, profitability, and growth. Box Theory™ is a unique method that transforms complex and expensive process-improvement techniques of Fortune 500 companies into a painless solution for small-business owners. You can expect a return of 10, 100, or even a 1000 times the incidental cost of this course. In fact, you are probably losing far more money every day you wait to get started. "The best business course I've ever taken." - Kirk B. What could be better than a turnkey system for developing all of your business systems and processes! Box Theory™Gold is an innovative software program for creating smooth running, cost-effective, high-performance systems, and for documenting the details of your business operations. Whether you want to start, grow, fix, or franchise your business, this one-of-a-kind software tool will help you get the job done right, and done fast. Box Theory™Gold will cut your system development time in half, paying for itself almost immediately. In a few minutes a day, you can learn the most important skill any small-business owner or entrepreneur can possess. I call it "The Master Skill—How to Build Effective Business Systems and Processes." You will follow a detailed workshop outline that guides you through powerful business principles, software video tutorials, real-world examples, and brainstorming worksheets. In a few short weeks, you will have created your own Organization Blueprint, and have a hands-on experience developing or refining one vital system within your organization. After that, you are on your way to creating an organization of excellence. Don't wait to get started! Effective business systems are the most misunderstood and underutilized tools of the small business owner. If your business plan does not include a focus on business processes, I invite you on a journey of discovery that will forever change the way you do business. Only disciplined and systemized organizations will survive the current economic challenges. Sign up in the left column to receive our Free Information and discover the power of Systems Thinking. Systems are the Solution! "Every business owner or manager needs to become an expert at creating effective business systems. Sign up above to get started today!" "We have achieved exceptional results from many Box Theory systems we have put in place. The information is clear and concise, and I discovered how easy it can bel"